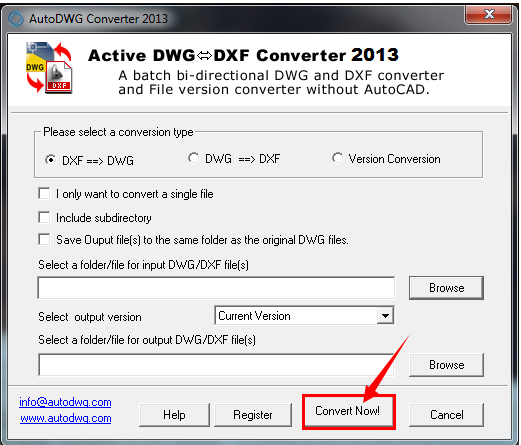 AutoDWG DWG DXF Converter 2019, Faster than ever! 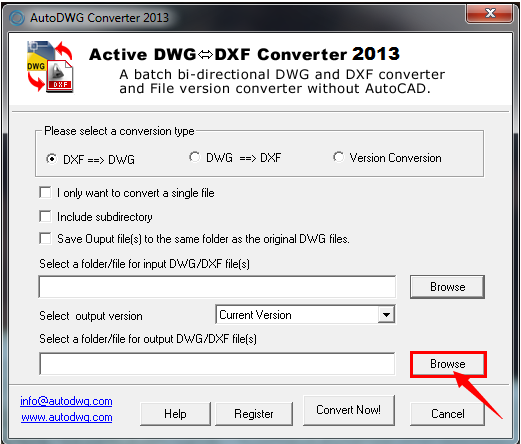 A bi-directional DWG-DXF batch converter and a DWG version converter without AutoCAD! Convert from DWG to DXF. Convert from DXF to DWG. Convert Version from low to high and high to low for DWG and DXF. Support command line (for Pro and Server Version only). Support AutoCAD version from R12 to 2019. AutoCAD DXF (Drawing Interchange Format, or Drawing Exchange Format) is a CAD data file format developed by Autodesk for enabling data interoperability between AutoCAD and other programs. 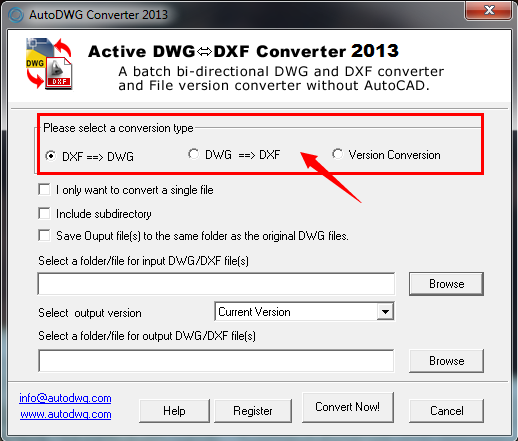 You may convert between DWG and DXF as you wish without AutoCAD. 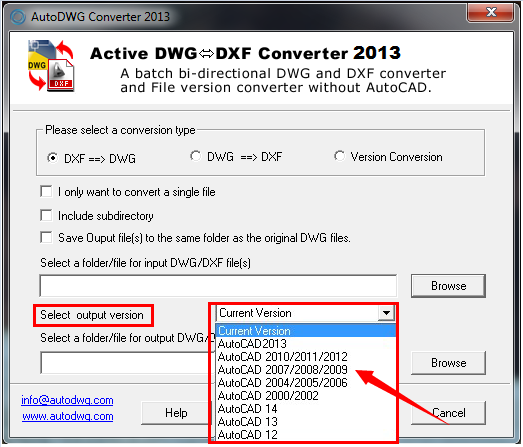 You may change versions of DWG and DXF both from low to high and high to low between AutoCAD R12 and Auto CAD 2019. 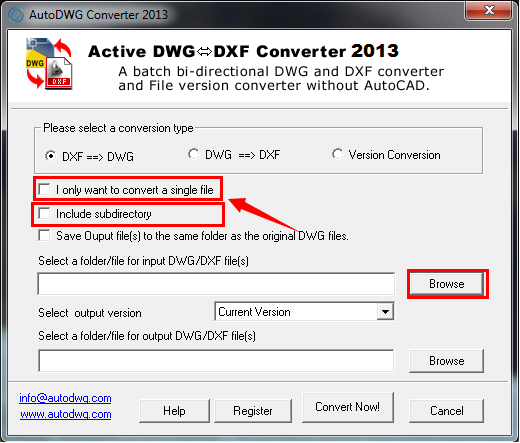 Complete folders and even subfolders of DWG and DXF files are selectable to convert in one go. 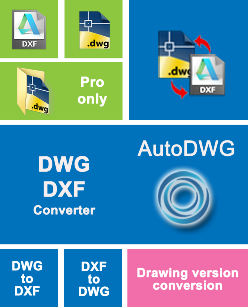 The latest version of this DWG DXF Converter 2019 has been released recently. 1. What's difference between standard and Professional version? Professional version supports command line, allows you convert dwg to dxf or dxf to dwg in silent without interface. Professional Version and normal version are in the same program with different registration code. Note: if you only want to convert a single file, check the option: I only want to convert a single file. The Converter will let you open a file to convert. dll registration failed, how to fix it? Do you offer customized service?